Comfort food, easy comfort food. Whether it is an eggy oven baked custard or Italy's voluptuous Panna Cotta, creamy dairy based are always a hit. I experiment with Panna Cotta often, creating different flavors and working with lots of different textures, from a light silky cream to a heavier more dense one. I use cream and milk in combination with other dairy products such as buttermilk, yogurt, creme fraiche and mascarpone. Each has its own unique characteristics and depending on how I combine them I can create a wide variety of desserts. The flavoring the possibilities increase even further. Start with vanilla, and then let your imagination take over. Try espresso, blood orange juice, mint or chocolate. Panna Cotta can also be savory, flavored with everything from herbs to Parmigiano. But some of my favorites start when I open my liquor cabinet. The world of spirits has plenty of room for Panna Cotta. Here I have used Amaretto, the "little bitter" almond liqueur. I like to use Luxardo Amaretto di Saschira. 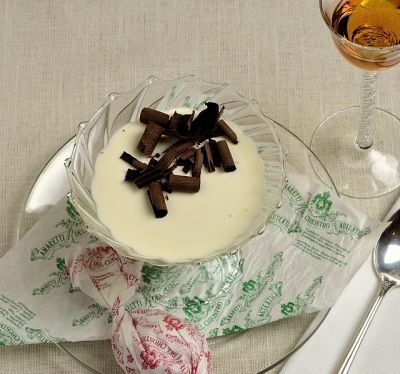 Not quite as sweet as other brands, its heady combination of marzipan flavor and burnt sugar is particularly complementary to the creamy base of Panna Cotta. But if you have another brand in your liquor cabinet, by all means use it. This luxurious dessert will fill your mouth with soft sweet almond flavor. Some technical tips: Don't be put off making Panna Cotta because you have to work with gelatin. Once you get the hang of it, you'll wonder what all the fuss was about. Treat the gelatin properly, and you will be rewarded with a smooth texture and perfect "set" (firmness.) I use KNOX Gelatine which is available in all supermarkets. Look for it in the baking section. The success of any Panna Cotta will rest largely on its set. Too loose and it is like pudding. Too tight and it is like rubber. The amount of gelatin is the key. I tried several amounts of gelatin with this one. I started with 2 1/4 teaspoons, and the set was not firm enough. I upped it right to 3 teaspoons, and it was much too firm. I backed off to 2 ½ teaspoons, finally settling on a scant 2 ½ teaspoons. Remember though, the set of Panna Cotta is very much a personal choice. Feel free to change the amount up or down. Just understand you will not need to change it very much. You must first "bloom" or soften gelatin by sprinkling it over a portion of the liquid called for in the recipe. Set it aside for 5 minutes, during which time the gelatin will swell and soften as it absorbs the liquid. Next, "scald" the milk, cream or other dairy in the recipe with the sugar by heating until small bubbles form around the edge of the saucepan. Don't let the mixture boil. Remove the saucepan from the heat, and stir in the gelatin mixture until it dissolves. This step also ensures that the sugar dissolves. It is that easy. Next, you must cool the Panna Cotta before pouring it into serving glasses. This step ensures a smooth and uniform set and avoids "roping" in which strands of gelatin form in the Panna Cotta due to uneven cooling. To make the bath, fill a large bowl with ice water. Pour the Panna Cotta into another bowl, slightly smaller than the first. Place the bowl with the Panna Cotta in the ice water bath for several minutes, stirring occasionally as it cools. Take care not to let it thicken too much, or it will not pour smoothly, and don't splash ice water into the Panna Cotta. 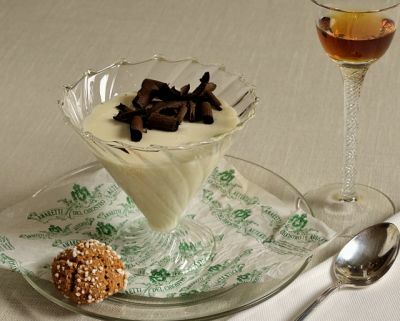 Once slightly cooled, the Panna Cotta can be poured serving glasses, covered with plastic and refrigerated. Follow these steps and you will be rewarded with a silky, luxurious dessert. Make it once or twice, and you will have built your confidence and mastered Panna Cotta. Trust me! This Panna Cotta is perfect for elegant dinner parties. I make it with a full 1/4 cup of Amaretto along with best quality almond and vanilla extracts. Your guests will love this. A note: Another benefit to the use of an ice water bath is that the slightly thickened Panna Cotta, once poured into serving glasses can be moved from the work counter to the refrigerator without shifting in the glass. That way I achieve a perfectly even line of Panna Cotta. Oh my goodness!! I am so thrilled to have won the birthday contest. 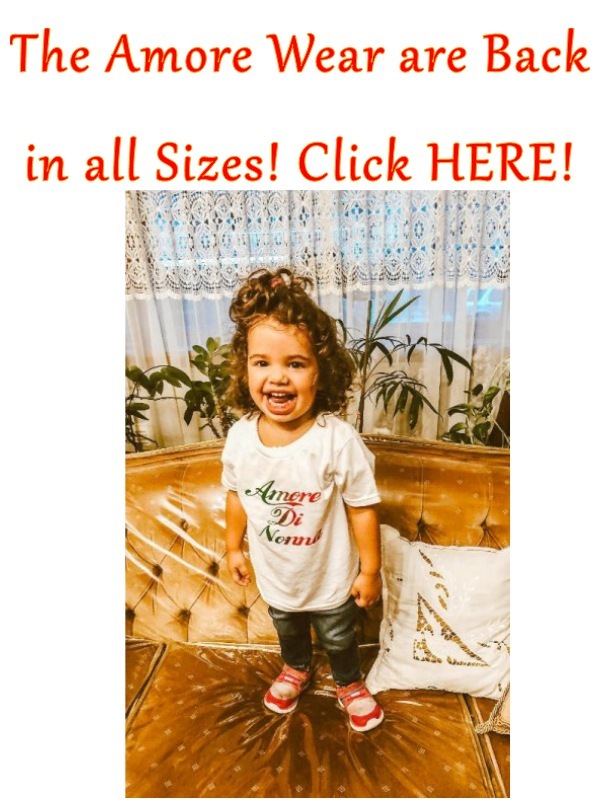 Rossella, I hope you had a wonderful birthday, and thank you so much for selecting my recipe. I love making corzetti, and they are always a crowd pleaser.